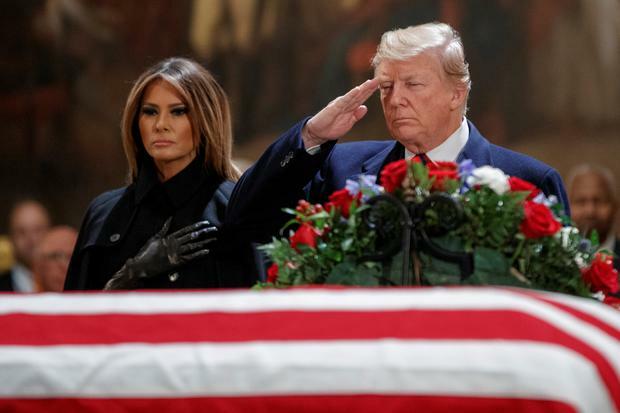 Donald Trump and first lady Melania Trump have travelled to the US Capitol in Washington to pay their respects to former president George HW Bush. With Mr Bush's casket on top of the Lincoln Catafalque, first used for Abraham Lincoln's 1865 funeral, dignitaries came forward to honour the Texan whose efforts for his country extended three quarters of a century from the Second World War to his final years as an advocate for volunteerism and relief for people displaced by natural disaster. In an invocation opening the ceremony, the US House chaplain, the reverend Patrick J Conroy, praised Mr Bush's commitment to public service, from Navy pilot to congressman, UN ambassador, envoy to China and then CIA director before being elected vice president and then president. "Here lies a great man," said House speaker Paul Ryan and "a gentle soul. ... His legacy is grace perfected". Mr Trump did not attend, but he and the first lady came to the Capitol later on Monday to pay tribute. They stood in front of the casket with their eyes closed for a few moments, before Mr Trump saluted the casket. Political combatants set aside their fights to honour a Republican who led in a less toxic time and at times found commonality with Democrats despite sharp policy disagreements. Sent off from Texas with a 21-gun salute, Mr Bush's casket was carried to Joint Base Andrews outside the capital city aboard an aircraft that often serves as Air Force One and designated "Special Air Mission 41" in honour of Mr Bush's place on the chronological list of presidents. Cannon roared again outside as the sun sank and his eldest son, George W Bush, stood with his hand over his heart, watching the casket's procession up the steps. Mr Bush was remembered just feet away from what he called "Democracy's front porch", the west-facing steps of the Capitol where he was sworn in as president. Although Mr Bush's funeral services are suffused with the flourishes accorded presidents, by his choice they will not include a formal funeral procession through Washington.